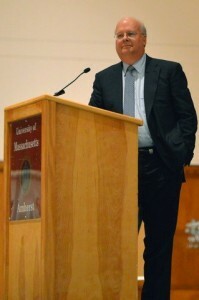 On Tuesday night I had the opportunity to see Republican strategist and former Deputy Chief of Staff Karl Rove speak at UMass Amherst. The event hosted by the school’s College Republicans was understandably very controversial. UMass is after all the state school of one of the most liberal states in the country. College Republican president David Kaufman was even asked by some to consider canceling the event. However UMass being the bastion of diversity that it is, hosted the event which drew hundreds of protesters and supporters, many of whom did not make it into the hall. Sadly Mr. Rove’s speech was too intolerable for some of the more “open minded” Liberal students in the crowd. From t he moment Mr. Rove started speaking groups of students stood up and acted out the now unoriginal “MIC CHECK” occupy theme, and proceeded to read some of their grievances which nobody could hear. When one group of protesters was finally removed another would stand up and start the same shenanigans. This scene played out for about 15 minutes before the Chancellor of UMass asked the students to be respectful of free speech and to let the man continue. However, direct orders from the head of the school could not fully deter these sages of tolerance from constantly interrupting Mr. Rove, yelling “Murderer”, “War Criminal” and things of that nature throughout the whole speech. Outside of the event hall many signs were posted forbidding anyone from bringing posters or signs into the auditorium. This did not stop these brave crusaders from sneaking in posters that read “Karl Rove should be In Jail”-or something of that nature- and holding them up. Those students were also asked to leave. By the time he concluded his remarks about 1/3 of the audience was gone, yet people still shouted slurs and even began interrupting other students during the Q&A. During all of this Mr. Rove asked the students to be respectful and have the courage to direct their frustrations at him during the Q&A. Only one heeded this request and he went rambling on a diatribe about how the US and the Republican Party supported apartheid in South Africa; he was removed. Now most everybody subscribes to the consensus that people should be allowed to express their rights to speech. However the actions of these students crossed line of reasonable protest and interfered with Karl Rove’s right to be heard and his supporter’s right to assemble. It was clear they had no intent on hearing a different point of view and their actions were destructive of an intellectually diverse dialogue. Unfortunately this just further personifies the Left leaning biased seen on college campuses all over the country. It’s fine for Bill Ayers a former terrorist to teach and achieve tenure at the University of Chicago, but when Karl Rove comes to a school in Massachusetts it’s too much to handle and he gets called a murder. What would the reaction be if David Axelrod had been the speaker? As senior adviser to Obama he oversaw drone strikes that killed a lot of innocent people. Would he be called a war criminal or a murderer? No, the red carpet would be rolled out and he would be met with a chorus of praise. However one could bet that the Conservative students would not have behaved in the same way their opponents did on Tuesday night. This seems to be a reoccurring theme with those on the left. If we don’t like your beliefs then we’ll shout over you and use ad hominem attacks to shut you up. It is scary to see that our education system is producing youth who ironically are an affront to diversity. When challenged to test their ideas and accusations in the ring they cowered behind their posters and chants. They had an opportunity to pick the brain of one of the top men behind the Bush White house and the best they could produce was a speech about apartheid. They should be shamed rather than praised. If this is what we can be expecting from future college graduates then God help Bipartisanship and God help diversity of thought and beliefs.